Which team will play against India in the Nidahas Trophy final? Bangladesh and Sri Lanka will fight for the spot on 6th T20. Asian Tigers defeated Lankans in their last encounter and they will be more confident as their skipper Shakib-Al-Hasan is back in the team. Get your FREE Team or make your perfect team for dream11 which will take you to the 1st place in fantasy leagues. In Today’s Dream11 Fantasy Cricket Prediction/Astrology| SL v BAN 6th T20, we will provide you all the details like playing 11 of both the teams, pitch report, players recent and past performance, who will win the match, and what our experts have to say about the toss. 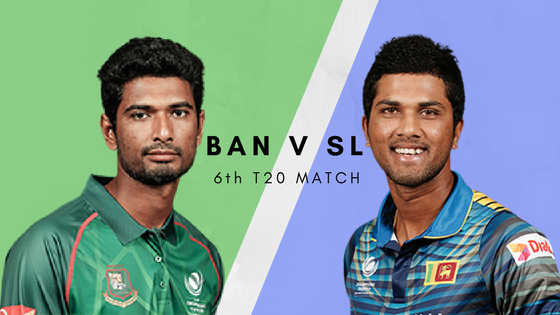 Match: India and Bangladesh in Sri Lanka T20 Tri-series,2018, SL v BAN, 6th T20. Average first inning score is 158. Average second inning score is 137. Highest total on this ground was 215/5 in 19.4 overs by BAN v SL. Lowest total on this ground was 80/10 in 17.2 overs by AFG v ENG. Throughout the tournament the pitch is not supporting the bowlers so expect the same to happen in this match also. The batsmen will enjoy batting in this ground. In the last game, Rubel Hossain was getting a reverse swing and it is expected that he may continue with his swing at the depth overs in today’s match also. If we look at last five matches played against each other, Lankans are ahead of Asian Tigers as they have won three games out of 5 matches but BAN will be high on confidence as they have chased a ferocious total. The weather will be similar as it was in the previous games. Rain may happen or may not happen that means chances of rain will be 50-50. At the time of the play, it will be partly cloudy and the temperature is expected to be 26-degree Celsius. Mahmudullah (c), Tamim Iqbal, Soumya Sarkar, Nazmul Islam, Mustafizur Rahman, Sabbir Rahman, Mushfiqur Rahim (wk), Mehidy Hasan, Abu Hider Rony, Shakib Al Hasan, Taskin Ahmed, Rubel Hossain, Abu Jayed, Ariful Haque, Liton Das, Nurul Hasan, Imrul Kayes. Thisara Perera (c), Kusal Perera (wk), Kusal Mendis, Jeevan Mendis, Upul Tharanga, Dasun Shanaka, Akila Dananjaya, Suranga Lakmal, Dushmantha Chameera, Nuwan Pradeep, Dhananjaya de Silva, Danushka Gunathilaka, Amila Aponso, Isuru Udana. Dinesh Chandimal’s suspension for two matches will definitely land SL into problems. They don’t have many options after losing against India. Their seam bowlers need to take more responsibility if they want to win in “DO-or-DIE” match. Sri Lanka is most likely to play with the same playing 11. Danushka Gunathilaka, Kusal Mendis, Upul Tharanga, Dasun Shanaka, Kusal Perera (wk), Thisara Perera (c), Jeevan Mendis, Nuwan Pradeep, Suranga Lakmal, Dushmantha Chameera, Akila Dananjaya. Bangladeshi Skipper will return to the playing 11 if he passes the fitness test before the match. Neither Mehidy Hasan nor Nazmul Islam has performed that means any one of them will make a way for the Captain. Soumya Sarkar form will be a concern for Ban. Most likely Mehidy will be retained. Soumya Sarkar, Tamim Iqbal, Mushfiqur Rahim (wk), Liton Das, Mahmudullah (c), Shakib Al Hasan, Sabbir Rahman, Abu Hider Rony, Mustafizur Rahman, Nazmul Islam/Mehidy Hasan, Rubel Hossain. Mushfiqur Rahim: Rahim has scored 163 runs in last three matches. He scored 72 runs in the last inning and contributed 47 points. 50.12% of the users have selected him. Kusal Perera: Perera has scored 143 runs in the last three games. He has scored 3 runs in the last inning and contributed 3.5 points. 48.01% of the dream11 fantasy users have taken him in their team. Pro Tips: You can choose either of them but try to keep Kusal in your team if you are playing with a single team. If you are playing with multiple teams make a combination from the above list. Tamim Iqbal: In Nidahas Trophy Tamim has made 89 runs. In the last inning, he scored 27 runs and contributed 18.5 points. 85.8% of the users have chosen him. Soumya Sarkar: Despite being out of form in this series he managed to score 282 runs in last 10 innings. He has scored 1 runs in the last match and contributed 6.5 points. 36.78% of the users have chosen him. Liton Das: Das has scored 84 runs in this tournament. He has scored 7 runs in the 5th T20 and contributed 6 points. 70.39% of the users have selected him in their dream11 team. Kusal Mendis: In the last 5 matches he has scored 246 runs with an average of almost 50. In the last inning, he has scored 55 runs and contributed 42 points. 92.28% of the users have selected him. Danushka Gunathilaka: He has scored 62 runs and took 1 wicket in this series. In the last game, he scored 17 runs and contributed 11.5 points. 70.91% of the users have taken him in their team. Upul Tharanga: He managed to score 71 runs in this series. He scored 22 runs in the last game and contributed 14.5 points. 53.52% of the dream11 users have taken him in their fantasy teams. Pro Tips: Try to keep Tamim, Liton Das, and Mendis in your team. If you are playing with multiple teams make a combination from the above list. Mahmudullah: Mahmudullah scored 32 runs and took 2 wickets in this tournament. In the last game, he scored 11 runs and contributed 8.5 points. 71.05% of the users have selected him. Shakib Al Hasan: If we look at his batting average in T20, it is almost 24 runs. He didn’t play the last three matches in this series but now he is back. 13.79% of the users have selected him. Thisara Perera: 87.19% of the users have chosen him in their team. He has scored 37 runs and took 1 wicket in this series so far. In the last inning, he scored 15 runs and contributed 19.5 points. Pro Tips: Try to keep Shakib on your team if you are playing grand league as very fewer users have selected him. For multiple teams select from the above list. Akila Dananjaya: Dananjaya was unable to take any wickets in the whole Nidahas Trophy but he took 2 wickets in the last inning and contributed 26.5 points. 53.9% of the user thought of keeping him in their team. Suranga Lakmal: Lakmal only played one game but he was not effective that much. He contributed 4 points in the last match. 17.09% of the users have taken him. Nuwan Pradeep: So far in this Tri Series Pradeep took four wickets. He took 1 wicket in the last inning and contributed 9 points. 56.35% of the users have chosen him in their team. Rubel Hossain: Hossain managed to take 4 wickets in this tournament. He took 2 wickets in the last match and contributed 28 points. 76.37% of the users have selected him. Mustafizur Rahman: In the last 7 matches Rahman took 9 wickets. He has taken 4 wickets in this series. He only contributed 1 point in the last game. 74.95% of the users have chosen him. Pro Tips: Try to keep fewer bowlers in your team as the pitch is not supporting the bowlers. Pro Tips: Keep Shakib as a Captain in the grand league as very fewer users have selected him. Our Astrology team predicts that Shakib will Play. The Asian Tigers chased the huge total in the last game the played against each other but according to our expert, Lankans will win the 6th T20. Toss will play a very important role as the team winning the toss will decide to bowl first. Our astrology department says that Sri Lanka will win the toss and they will follow the trend means they will bowl first. Conclusion: Thanks for supporting our website. This is what we in Today Dream11 Fantasy Cricket Prediction| SL v BAN 6th T20. Feel free to give us suggestions so that we can improve and provide you, FREE teams. GOODBYE!